Young graduates get a head start with reputed firms. Being an institute that is led by the industry, it came as no surprise to us that 100 percent of the students who opted for a job after graduation got placed with leading international property consultants, developers, valuation firms, construction firms and facilities management companies in roles like sales, valuations, credit underwriting, facilities management etc. Companies like JLL, Tata Housing, CBRE, Arihant Superstructures Ltd., Sathya Developers, Omaxe Developers were some of the leaders of the industry who hired our students. Usually, after obtaining a BBA degree there are two options open to students which are: either to get a job or study on for another two years and get a degree in MBA. This certainly enhances their employability but in cases of a regular BBA it is next to impossible to find a good job without a further degree in MBA. However, we can proudly say that this is not the case with our specialized BBA programs. From day one, our students follow a rigorous curriculum that is designed by the titans of the real estate industry with a sharp focus on what the requirements of the industry are. A well-seasoned faculty derived from the best institutes and organisations from around the globe imparts knowledge that is application based. Along with their regular curriculum students go on site visits and learn the rudiments of what is expected from them by the industry. After their fourth semester, they are interned with leading companies of the sector. This entire process ensures that when they graduate, they are ready to face the corporate world and are readily recruited by an industry that seriously lacks qualified talent. Our placement team worked with each student individually to ensure that their preference and interest were kept in mind while arranging interviews for them and our first batch of BBA graduates have been successfully placed. It is worth noting that a prestigious company like Tata Housing who do not usually hire BBA graduates were willing to bend their policy to recruit one of ours. CBRE were impressed enough by one of the students to offer him the same salary that is normally offered to an MBA. This has only reinforced our belief that there is a growing market of jobs for qualified young talent with a specialized BBA degree in the real estate sector. Need more information to make a decision? See how an RICS degree can help give you an edge over others. 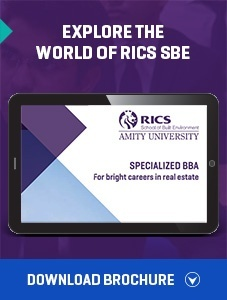 RICS SBE, Amity University does not guarantee job placements to the students or alumni. While we have had 100% placement record in the past however past performance is no guarantee to a repeat performance in the future. It is our endeavour to provide job interview opportunities to all eligible students however the selection of the student is dependent on their interview performance and acceptability by the prospective employer. RICS SBE, Amity University shall not be responsible for any disagreements or disputes arising between the employer and the employee (who is an RICS SBE, Amity University alumni).